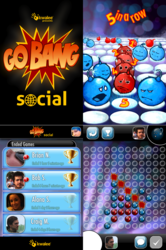 Kwalee launch a new and improved version of their game, Gobang Social, into more App Stores. Gobang Social is a turn based strategy game that is played with Facebook friends. Following the release of their multiplayer game Gobang Social in New Zealand, Kwalee have launched a new and improved version of their game into more App Stores. After developing features and adding further enhancements to Gobang Social, version 1.2 is now available in Australia, Japan, Korea, Hong Kong, Singapore, India, Indonesia, Philippines, Thailand and Taiwan. Fully integrated with Facebook, players can begin playing now with their Facebook friends. Kwalee released V1.0 of Gobang Social in the New Zealand App Store at the beginning of February. This was accompanied with a discussion forum: http://www.gobang.geek.nz/forum/ to develop the game into V1.1, which was released 3 weeks later. Gobang Social is a turn based strategy game that is played with Facebook friends. It is derived from the Asian game Gomoku. Kwalee’s fun game is a version of connecting 5 in a row horizontally, vertically or diagonally, in a 12 X 12 matrix that requires strategic thinking. The game is free to buy and free to play. The new V1.2 release contains many further enhancements including play against random opponents, instant messaging chat, a streamlined user interface, great music and sound effects for a great gaming experience. Watch the Gobang Social video on YouTube available below. "It is fantastic to publish the first game in new countries. The great team we have built at Kwalee have gone from nothing, to being a publisher in a very short time. Now we look to build on this with a further range of games and with continuous improvements to those that we publish." "Kwalee is climbing many learning curves in an incredibly competitive marketplace. Everything we do is driven by the customer, and this phased launch allows us to adapt to give them what they want." Kwalee is a startup company based in Leamington Spa to develop and publish multiplayer social games for mobile devices. Founded by David Darling CBE who has many decades of experience at the top level of the video game industry with contributions to very many #1 games on many platforms in his CV. Kwalee is different. We seek to excite and entertain our customers with innovative new products that provide special experiences. Our ethos is based around a set of core values that put the customer first and which harness the creative skills of our staff to the maximum in order to do so. Kwalee is still at its beginning and so is very actively recruiting those special people who want to join us in our exciting journey. Check out our website: kwalee.com, Facebook page: facebook.com/kwaleeteam and Twitter @kwaleeteam for more information.